This is a quick dish if you have a decently stocked pantry and some fresh veggies on hand. 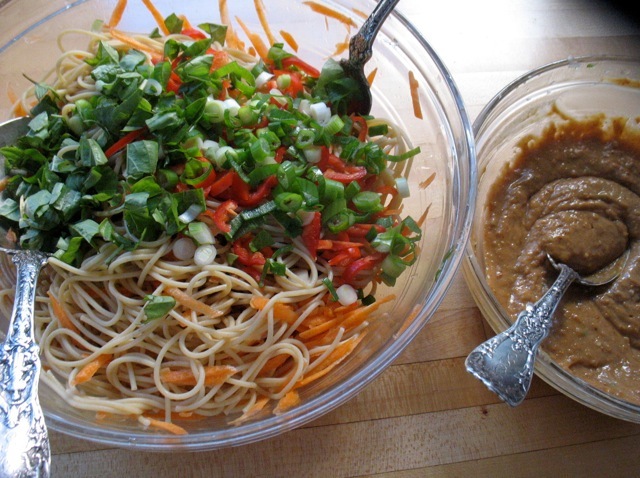 And leftover peanut sauce is always good to have around. This dish is much more photogenic before you mix in the peanut sauce so I’m sparing you the image of the homely but very tasty results. I have taught this dish (or variations of it) many times and figured it was time to post it after a 7-year-old neighbor/friend requested it for dinner the other night. I love it when children want bold flavors and I happily obliged. I accidentally made it a bit spicier than I intended but said 7-year-old ate a big serving and only at the end, quietly admitted to her mom that it was a bit too spicy! I like this substantial, room temperature dish especially when it gets cooler out. It’s hearty and warming because of the zippy peanut sauce but it’s also crisp and fresh from the lime juice and the raw veggies. If you have leftover chicken floating around or some shrimp in the freezer it would be even heartier but it’s pretty substantial as is. My first batch of Kimchi. There is a thriving “pickle scene” in Portland evidenced by the number of vendors of all things pickled and fermented at our many farmers’ markets, the pickle plates on restaurant menus, and at not-to-be-missed annual Portland Fermentation Festival that alas I have always missed! 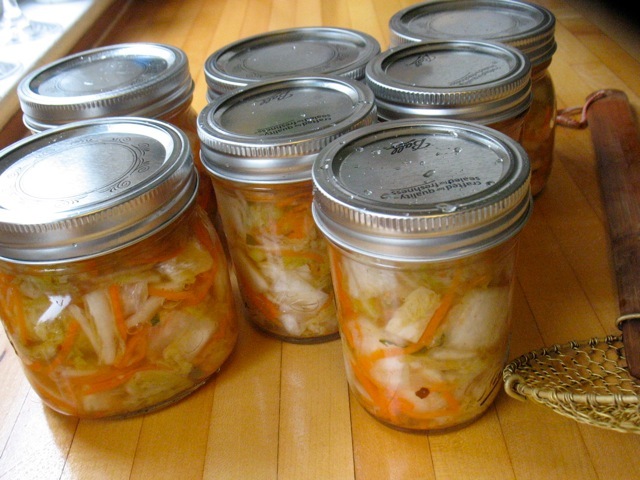 Fermented foods were once a more substantial part of many culture’s cuisines and still are in some places, especially in Southeast Asia. In addition to being a good way to preserve the harvest, add flavor and punch to any meal, they are very good for us. So with all this in mind and some beautiful Napa cabbage in the fridge I jumped into the fermentation fray guided by this witty and experienced fermenter and made Kimchi (Korean fermented vegetables) for the first time. It was straightforward and fun and now I have lots of lovely jars of it to enjoy and give away. If you’ve made it before or just love it, I’m eager to hear how you make it and eat it. So far I’ve mostly been eating as a side/garnish with other things but look forward to branching out. And finally, I have spots available in my Beans and Grains in Hearty Winter Salads class. We’ll be using all kinds of beans, quinoa, and farro and mixing them with arugula, kale, broccoli, beets and winter squash (not all together!) for the most satisfying dishes. Quick, easy (if you have everything on hand), and a crowd pleaser. Feel free to add other veggies like thinly sliced cucumber, steamed broccoli or cauliflower, etc. This is one of the few dishes in which I prefer whole wheat spaghetti. Barilla is my favorite brand for this. Blend all the sauce ingredients together in a small bowl until smooth and set aside. Mix grated carrots with 2 tablespoons rice vinegar and let sit while you cook the pasta. Bring a large pot of salted water to a boil and cook pasta until al dente. Drain pasta in a colander, reserving half a cup of the cooking liquid, and rinse with cold water until cooled. Toss with sesame oil and place in a large serving bowl. Add carrots, pepper, scallion and herbs to the noodles and toss. Pour about half of the sauce over the noodles and toss with a couple of spoons or a pair of tongs, adding more sauce as needed to coat the noodles. If the sauce is too thick to blend smoothly with the noodles and vegetables, add a tablespoon or two of the reserved cooking water while tossing. Serve at room temperature.